Why not give in to the urge to own a beautiful silver ring and add it as a treasured piece to your jewelry collection. 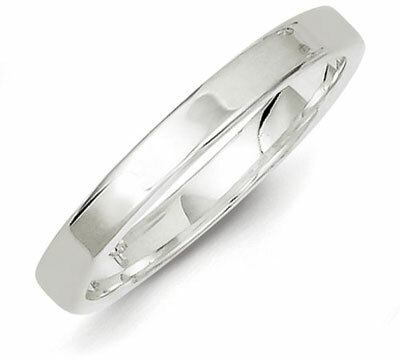 The Sterling Silver 3mm Flat Band is a perfect example of simple elegance. It creates an appealing look on the finger with a polished band that brings out the best white and silver tones in the precious metal. This ring was designed with a slender width of only 3mm, which serves to enhance the feminine quality of the band. With its highly polished exterior, rounded edges, and a composition of only the finest silver (.925), this charming ring is well worth the investment. It is also a piece that adapts well to different styles and outfits, depending on the mood you want to convey. This lovely sterling silver band is a standard look that will never go out of style, and will never disappoint. You really can't go wrong with wearing a brand new silver band on your finger. It can stand alone or be paired with other pieces, as you like. We guarantee our Sterling Silver 3mm Flat Band to be high quality, authentic jewelry, as described above.